What did my birthday look like this year? Neither Angel nor I had work, and it was pretty much perfect! 5:00 a.m. Wake up with baby and feed him. He's wide awake after eating and I put him in his crib, where he rolls around and kicks and talks to himself until Angel wakes up and bathes him and take care of him while I keep sleeping. 6:30 a.m. Angel and baby come back into the bedroom playing the "Happy Birthday" song on Angel's portable speaker to wake me up. Cuddle with Cyrus for a bit, then take my shower, get baby dressed in my favorite pirate ship t-shirt (because babies should obviously wear mom's favorite clothes on mom's birthday), and feed him and put him down for a nap. 7:20 a.m. Chapatis for breakfast! Angel went to pick up a couple of the tortilla-like flatbreads from the roadside food stall while I was feeding the baby. 7:35 a.m. Beginning my sewing project. I had planned on spending my birthday with a good bit of extra free time for sewing and reading. I did get a pretty good headstart on my sewing project of choice the evening before and had several of the big pieces already together. It was a dress for little Sarah using fabric that Mom had bought for me to make her a dress with...back at Christmastime. Oops. Well, in my defense, I didn't have any patterns in her size, and I had to wait for some to be brought to me from America. 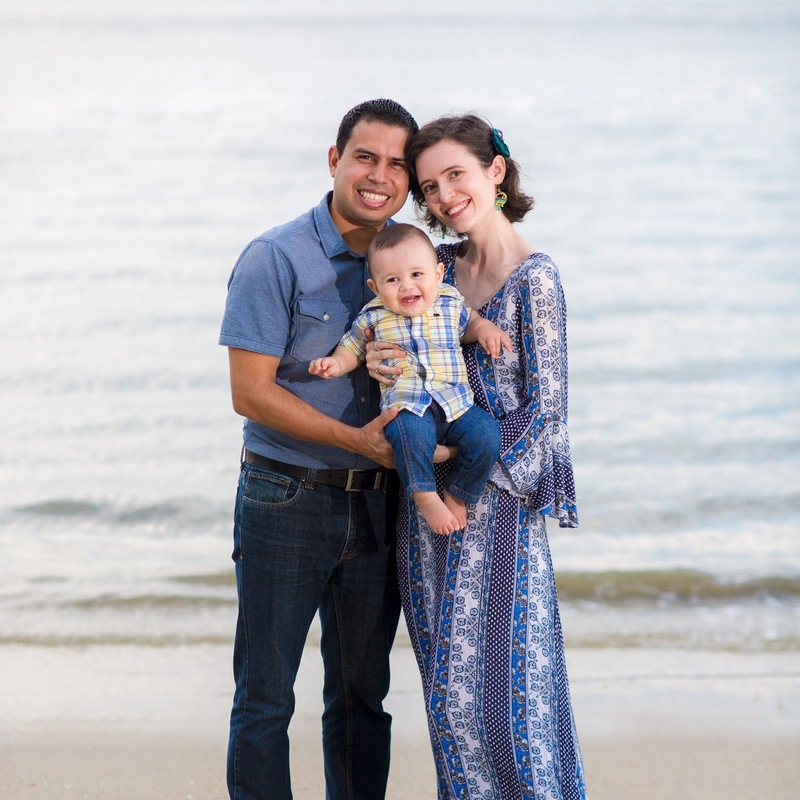 Together with Sarah, we picked out a dress pattern that had some fun little complexities that I was excited to try out--cold shoulder cut-outs, bell sleeves, criss-crossing straps in the front...it was a very fun pattern. 10:30 a.m. I finished the dress completely! I took a break in between to feed the baby after he woke up and then brought him to grandma's house for playtime while I continued sewing. I do my pilates workout, which is just following along to a youtube pilates video, and then I do my makeup, and put on my new watch which was my birthday gift from my parents. This was a pretty special gift--my parents gave me a watch for my high school graduation, and I loved it for many years, but a year or so ago, somehow the battery leaked acid into the face of the watch, ruining it. Mom had the idea to buy me a new watch for this birthday, and we went out shopping for it together, and I ended up picking out the exact same watch that I'd originally picked out for my graduation, just in a different color. What can I say? I guess I know what I like? 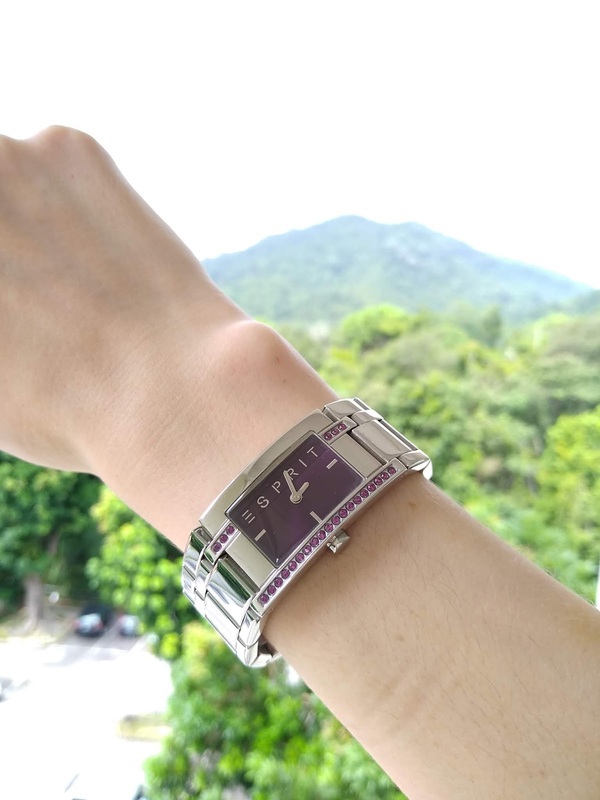 Also, I did actually try on some different styles, and it is not particularly easy to find a watch with a strap and face that look appropriately proportioned on my child-size wrists. Read my book for a while, Project 1065, by Alan Gratz. 12 noon. 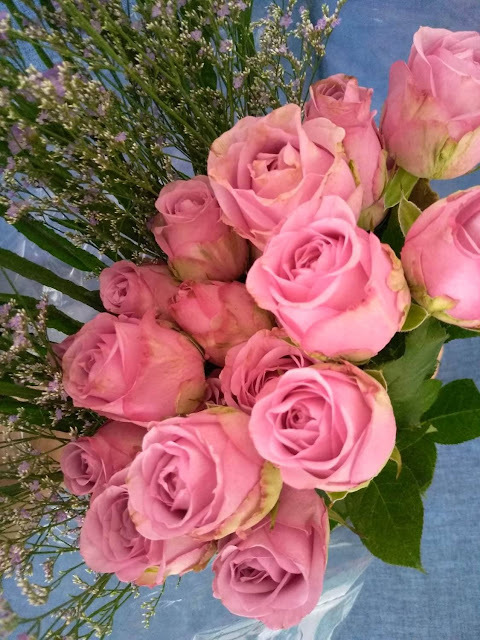 A friend stopped by with birthday presents, including a bouquet of purple/pink roses!! 1 p.m. Went downstairs to my family's house, baby was still napping, so I opened up presents from my sisters: a polka-dot circle skirt and a craft kit for making paper cacti! Ever since I wrote The Cactus Who Craved a Hamburger, it's become tradition for people to give me things with a cacti motif. We ate lunch together, of fried chicken, pumpkin, and baked potatoes. Then I painted my nails while hanging out with the family. When baby woke up he was hungry, and ate again. 3 p.m. Finished my book. 4. p.m. Time for a birthday dessert! 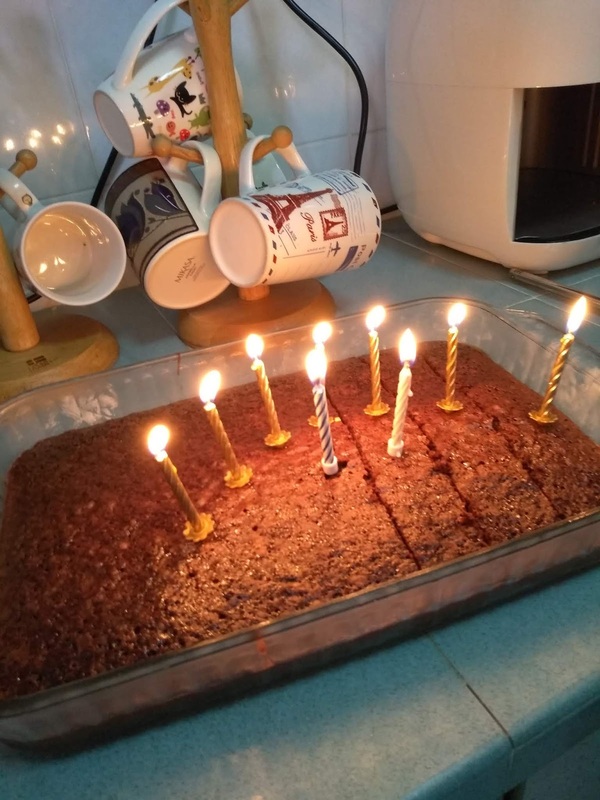 Brownies with candles. Angel had already started cutting up the brownies before we put the candles in, The family quietly sang Happy Birthday to me in the kitchen since Cyrus was napping in the other room, and we ate our snack. After that, I got out the paper cactus kit that my sister had given me and began working on that project. I like these, because they won't die, unlike the cactus that Angel gave me a couple years ago, which lived for about a year before giving up the ghost. The family decided to watch The Greatest Showman, which turned into a singalong, while I continued working on my paper craft. 6 p.m. Angel and I went out on a little birthday date. I'd requested a visit to the beach about 10 minutes away. Which is not the quietest place on a Saturday evening, but I often feel like we don't visit the beach often enough--I never tire of the wonder of the water crashing against the shore, and simply noticing how big the ocean is in comparison to the little island we live on. Since there were a good few people on the beach, it was a good time for people-watching, too. We saw three different couples with professional photographers, doing photoshoots in wedding clothes. We saw a group of people doing very complicated yoga poses that involved people balancing on top of other people. 8 p.m. We returned home, and picked up Cyrus from the family's house. He was in quite an active and alert mood, so after we went home and he had his bath, we all played on the floor for a while, placing toys just out of his reach so that he would push himself around and grab for them, and then I read him a couple Bible stories from his kids' Bible. 9:30 p.m. Cyrus was starting to wind down, so I fed him and put him down, and then worked on the computer for a bit--typing up this blog post, replying to birthday messages and emails...all that good stuff. That sounds like such a great day! Happy birthday!! This sounds like an absolute perfect birthday. I love that you were able to do everything you wanted to do -- some time to read and sew, but also some family time and a date with Angel. I also made reading a priority on my birthday and it was so nice to have that quiet time. I started to re-read one of my favorite books, Harry Potter! Happy birthday! Sounds like you had a lovely day and I'm impressed you sewed a dress for your sister so quickly! I love a birthday that has a good variety of activities, and NOT WORKING. Your beach walk looks lovely and I feel the same, I live in a 'beach city' but I don't go nearly enough! And now is the season to visit, when you can walk around and not get burned to a crisp. Happy birthday! I'm impressed that you can kill a cactus, because I thought only I could do that. I hear they're pretty hardy.